Do you love mermaids as much as we do? We know you’ll want to join other children ages 0-11 at the Library in January and February for a special presentation by our beautiful aquatic friend, Venessa the Louisiana Mermaid! Kids can enjoy special mermaid-themed storytimes and presentations on ocean conservancy at eight Library locations this month. Dates, times and locations are listed below. Registration is required for all. 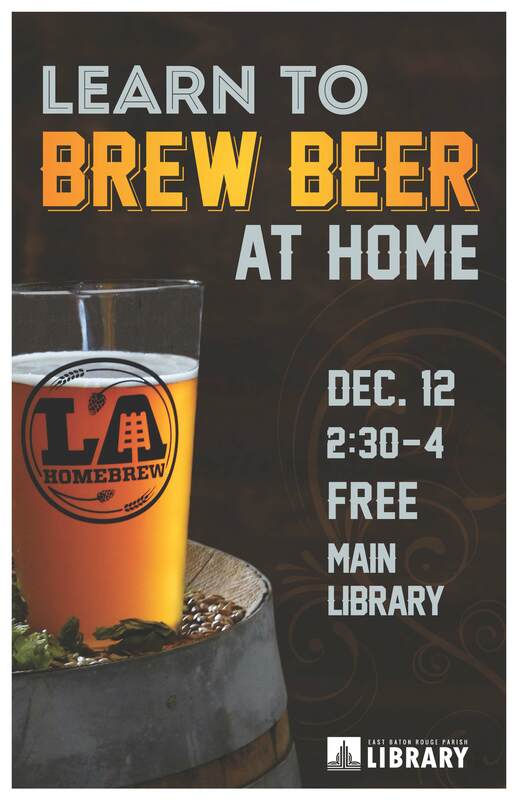 For more information and to register, call the Library location directly. 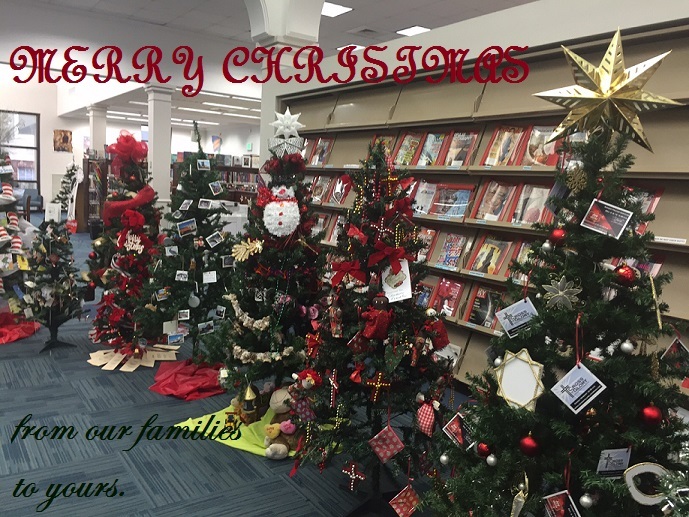 Posted on December 25, 2015 December 22, 2015 Categories UncategorizedLeave a comment on Merry Christmas, EBRP! The holidays are almost upon us. Relatives are flocking in from all over the place, and some of them have a lot of stuff to say, maybe with less tact than they think they have. But don’t worry – when in doubt, you can always come to the library. Adult coloring is a great way to destress, and the last one of the year is this Saturday, December 19th, from 1-3 PM at Jones Creek Regional. Maybe you can make something pretty to give the next person who asks you what you’re planning to do after graduation! It’s a great way to keep the peace. For more inner peace, come to the Jones Creek Branch on Sunday, the 20th, for a meditation class from 3-4:30. Nitin Gupta will teach you ways to improve focus and clarity and keep a sense of balance. Breathe in: they’re your family and you love them. Breathe out: soon they will go home. If you’re suddenly realizing you completely forgot to buy presents, or that the 25th of December was only a few short days away, or (as we sometimes do) that the December that is this month is the same December that Christmas happens in, stop by the Central Branch from 3-4 on the 19th to make marbled polymer clay pendants for the person in your life who likes jewelry. You can also stop by the Fairwood Branch at 6:30 on December 22nd to make a Harry Potter-style wand for your friend group’s biggest Potter fan. If you’re a teenager, there are lots more crafts scheduled – everything from duct tape wallets to LED-enhanced holiday cards. Check the library events calendar to collect them all. Not a creature was stirring, not even a cassowary. While Vader and Obi Wan sabre-fought in their heads. 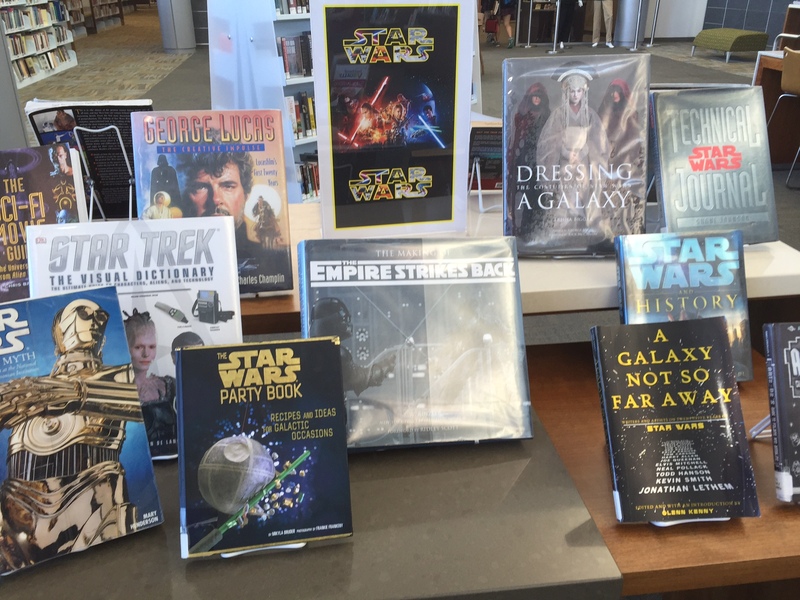 Just about every branch has something set up, and most of them also have some kind of Star Wars activity or craft planned for the weeks leading up to and following the premier. 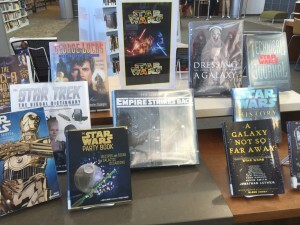 We’ve got a whole bunch of books about Star Wars. We’ve got a Pinterest board full of crafts – having something to do with your hands might keep you awake during Thursday’s twenty-hour marathon. (Are you going? Some of us are going. Some brave, dedicated souls.) 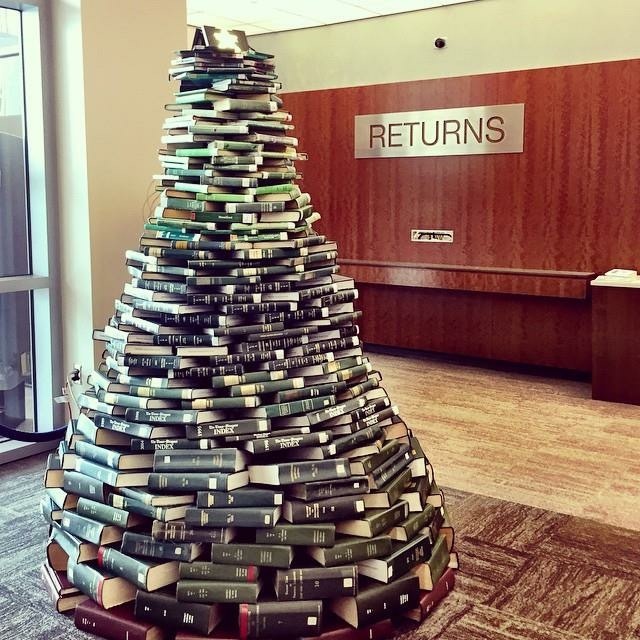 Keep an eye on the library’s social media pages for a thematic surprise coming soon! If this is not the most adorable geeky thing you’ve ever seen, please send us pictures of whatever is beating it. We must know. 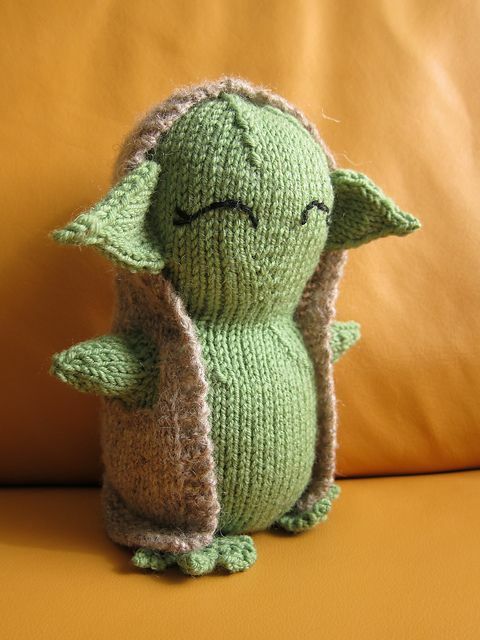 If you can’t make the premier, and you’re not a knitter or any of those other things, check out the Star Wars Cubeecrafts page! They’ve got most of the original characters, and since all you have to do is print them out, cut out the shapes, and fold and glue them together, it’s loneliness to desk friends in just a few short minutes. Or, if you’re a little more science-y and like your desk friends of the slightly less easily damaged variety, check out Thingiverse for some great 3D-printed Star Wars things! You can have them printed using the library’s 3D printers. And finally, if you just don’t care about Star Wars and are desperate to talk about something else (but don’t want to be completely alienated from your peer group), here’s a suitably themed sound bite to play whenever someone brings it up. *Because this comes up sometimes, it’s important that you know that none of us actually live here. Some of us have asked if we may. They won’t let us. Probably Darth Vader’s fault, somehow. Speaking of donating to good causes, why not turn the plastic bags from all that holiday shopping into something great? 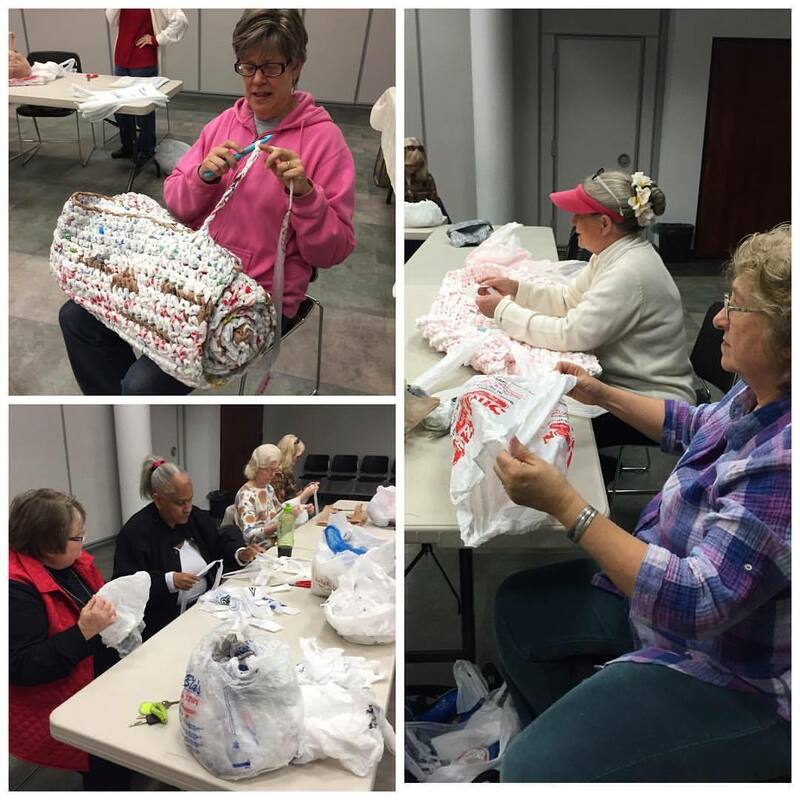 Crochet for a Cause, a regular program at the Main Library and at the Jones Creek Regional Branch, turns plastic bags into sleeping mats for the homeless. Each 3′ x 6′ mat is made of plarn, a “plastic yarn” made of recycled grocery bags. It takes about 500 bags to make enough plarn for one mat. The preparation takes about eight hours, and crocheting a bag takes about six to eight hours. When they’re finished, the mats are donated to Capital Area Alliance for the Homeless. 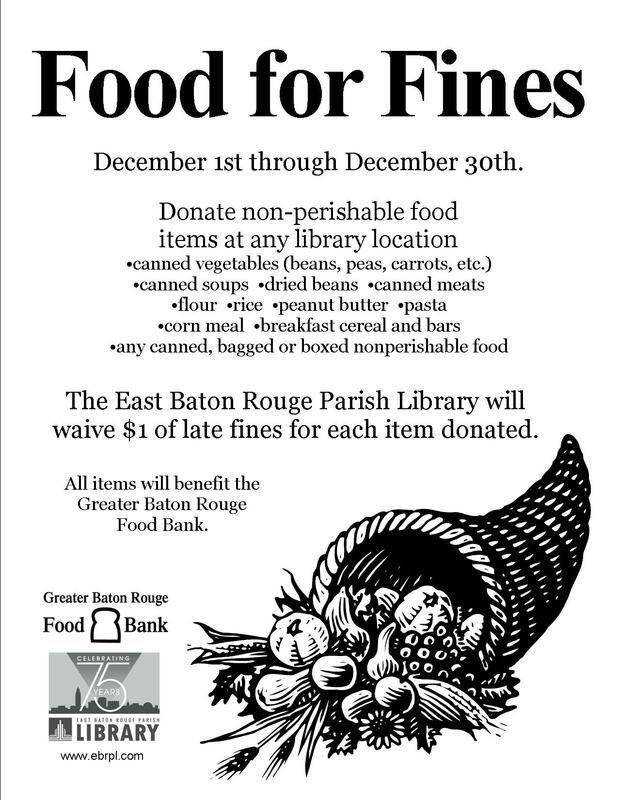 It’s a really great program, and there’s a way you can help! The group is running out of plastic bags and needs supplies. Bring in your plastic bags to the circulation desk of any of the branches and they’ll get to the crocheters soon. If you’re a teen and need service hours, this is a great way to get some, too! We need volunteers to make the plarn. Come to the Main Library’s Teen Room on the second Wednesday of every month from 3:00-5:00 to help out. Check out Pride-Chaneyville’s Crafting for a Cause program for another way to give back this season! …Okay, it’s a list of places to look for holiday events. We Louisianians take every opportunity to celebrate, and writing all of them down would make this a very, very long blog post. Visit Baton Rouge, an organization aimed at increasing tourism to our fair capitol city, has a constant list of every major event happening anywhere in Baton Rouge at any given point. If you’re looking for events for a specific day, look here. The Advocate’s calendar is pretty good, too, with both holiday-focused events and regularly scheduled programming for locals. On the other hand, the Baton Rouge Moms community has a great guide to family-focused, kid-friendly events happening up to sixty miles from the city. It’s got a great mix of culture, like The Nutcracker: A Tale from the Bayou, and places for kids to get some of that sugar energy out, like ice skating at the Baton Rouge River Center. BR City Key is another great resource for finding events specific to your neighborhood if you can’t travel far. If you celebrate Chanukah, don’t miss the State Capitol ceremony on the first day, December 6th, from 4:30-6:00 PM. Chabad Baton Rouge will host several other events around the city. And of course, the library’s got programming all over the place. If you like homemade Christmas ornaments, holiday-themed story time, winter movies, winter snacks, or anything remotely related to the month of December, keep an eye on our events calendar for a program happening near you. …but the library’s always nice and warm (and free of Iron Thrones). Baton Rouge Parents’ Magazine’s 11th Annual Sock It To Me Sock Drive will continue through December 10th. Socks will be delivered to area homeless shelters, where they are the most requested item, and to local hospitals, where they will be given to chemotherapy patients whose feet get cold during chemo treatments. Their goal this year is 15,000 socks, and if you’d like to help them meet it, call (225) 292-0032 to learn about setting up a sock drive of your own! Donations will go to organizations like the Capital Area Family Violence Intervention Center, St. Vincent de Paul’s Uniforms for Kids, and the YMCA’s homeless and outreach programs. You can drop off socks at the BR Parents office at 11831 Wentling Ave.
What better time than a national holiday to think about those that have come before us? The History Reference Center is a great place to find articles on exactly that. Like our other reference centers, the History Reference Center lets you search thousands of resources focused on a specific field. If you go into the advanced search options, you can also search a specific chunk of United States or world history using their “Timeline” feature. For example, Thanksgiving! You can do a regular search and come up with tons of stuff, or you can click on “European Colonization of the Americas” to learn more about that time period and all of the other stuff that happened before the USA began. Not even a little true, Ron Ulysses Swanson. If you’re interested in the origins of our biggest national holiday, this is a great place to start. You can also use it in combination with one of our databases full of teaching resources, ERIC, to find great ways to talk about this holiday with your kids in a way that respects both Native American history and culture, and what the holiday has come to mean: a time of gratitude and celebration. We certainly are. We’re grateful to continue serving as your information guardians. From our family to yours, Happy Thanksgiving.